THE hope of heaven fostered by an unrenewed mind is baseless and illusory. There exists not a single element of goodness in its nature. It is the conception of a mind at enmity with God. It is the delusion of a heart in covenant with death, and in agreement with hell. It is the treacherous beacon that decoys the too confiding but deluded voyager to the rock-bound shore. Unscriptural, unreal, and baseless, it must eventually cover its possessor with shame and confusion of face. But not such is the believer’s hope. Begotten with his second nature—the in-breathing of the Spirit of God—an element of renewed mind, and based upon the atonement of the Savior, it must be essentially a good hope. Cleansed from moral impurity, not in the laver of baptism, but with the blood of Christ; justified, not by the ritual of Moses, but by the righteousness of the incarnate God; sanctified, not by sacramental grace, falsely so called, but by the in-being of the Holy Spirit—the believer’s hope of heaven is as well founded as the throne of the Eternal. Moreover it is “a good hope through grace.” The first and the last lesson we learn in our Christian course is, that “by grace we are saved.” Lord! do You require of me one thought of stainless purity, one throb of perfect love, one deed of unsullied holiness, upon which shall hinge my everlasting happiness? Then am I lost forever! Its object is most blessed. The heaven it compasses is that blissful place where the holy ones who have fled from our embrace are reposing in the bosom of the Savior. They are the blessed dead. The day of their death was to them better than the day of their birth. The one was the introduction to all sorrow, the other is a translation to all joy. Blessed hope! the hope of being forever with the Lord. No more to grieve the Spirit that so often and so soothingly comforted our hearts; no more to wound the gentle bosom that so often pillowed our head. No more to journey in darkness, nor bend as a bruised reed before each blast of temptation. To be a pillar in the temple of God, to go no more out forever. And what a sanctifying hope is it! This, to the spiritual mind, is its most acceptable and elevating feature. “Every man that has this hope in him purifies himself even as He is pure.” It detaches from earth, and allures to heaven. Never does it glow more brightly in the soul, nor kindle around the path a luster more heavenly, than when it strengthens in the believer a growing conformity of character to that heaven towards which it soars. It is, in a word, a sure hope. Shall the worm undermine it? shall the tempest shake it? shall the waters extinguish it? Never. It saves us. It keeps, preserves, and sustains us amid the perils and depressions of our earthly pilgrimage. And having borne us through the flood, it will not fail us when the last surge lands us upon the shore of eternity. True mortification has its foundation in the life of God in the soul. A spiritual, yes, a most spiritual work, it can only spring from a most spiritual principle. It is not a plant indigenous to our fallen nature. It cannot be in the principle of sin to mortify itself. Human nature possesses neither the inclination nor the power by which so holy an achievement can be accomplished. A dead faith, a blind zeal, a superstitious devotion, may prompt severe austerities; but to lay the axe close to the root of indwelling evil, to marshal the forces against the principle of sin in the heart- thus besieging and carrying the very citadel itself- to keep the body under, and bring it into subjection, by a daily and a deadly conflict with its innate and desperately depraved propensities, is a work transcending the utmost reach of the most severe external austerities. It consists, too, in an annulling of the covenant with sin: “Have no fellowship with the unfruitful works of darkness”- enter into no truce, make no agreement, form no union; “but rather reprove them.” “Ephraim shall say, What have I to do any more with idols?” The resources of sin must be cut off: “Put on the Lord Jesus Christ, and make no provision for the flesh, to fulfill the lusts thereof.” Whatever tends to, and terminates in, the sinful gratification of the flesh is to be relinquished, as frustrating the great aim of the Christian in the mortification of the deeds of the body. Mortification is aptly set forth as a crucifixion: “Those who are Christ’s have crucified the flesh.” Death by the cross is certain, yet lingering. Our blessed Lord was suspended upon the tree from nine in the morning until three in the afternoon. It was a slow lingering torture, yet terminating in His giving up the spirit. Similar to this is the death of sin in the believer. It is progressive and protracted, yet certain in the issue. Nail after nail must pierce our corruptions, until the entire body of sin, each member thus transfixed, is crucified and slain. “There is a friend that sticks closer than a brother.” Proverbs 28:24. But if, taking the object of our solicitude by the hand, we gently lead him to God- if we conduct him to Jesus, portraying to his view the depth of His love, the perfection of His atoning work, the sufficiency of His grace, His readiness to pardon, and His power to save, the exquisite sensibility of His nature, and thus His perfect sympathy with every human sorrow; we have then most truly and most effectually soothed the sorrow, stanched the wound, and strengthened the hand in God. There is no sympathy- even as there is no love, no gentleness, no tenderness, no patience- like Christ’s. Oh how sweet, how encouraging, to know, that in all my afflictions He is afflicted; that in all my temptations He is tempted; that in all my assaults He is assailed; that in all my joys He rejoices- that He weeps when I weep, sighs when I sigh, suffers when I suffer, rejoices when I rejoice. May this truth endear Him to our souls! May it constrain us to unveil our whole heart to Him, in the fullest confidence of the closest, most sacred, and precious friendship. May it urge us to do those things always which are most pleasing in His sight. Beloved, never forget- and let these words linger upon your ear, as the echoes of music that never die- in all your sorrows, in all your trials, in all your needs, in all your assaults, in all your conscious wanderings, in life, in death, and at the day of judgment- you possess a friend that sticks closer than a brother! That friend is- Jesus! REGENERATION does not transform flesh into spirit. It proposes not to eradicate and expel the deep-seated root of our degenerate nature; but it imparts another and a superadded nature—it implants a new and an antagonistic principle. This new nature is divine; this new principle is holy: and thus the believer becomes the subject of two natures, and his soul a battle-field, upon which a perpetual conflict is going on between the law of the members and the law of the mind; often resulting in his temporary captivity to the law of sin which is in his members. Thus every spiritual mind is painfully conscious of the earthly tendency of his evil nature, and that from the flesh he can derive no sympathy or help, but rather everything that discourages, encumbers, and retards his spirit in its breathings and strugglings after holiness. A mournful sense of the seductive power of earthly things enters deeply into this state of mind. As we bear about with us, in every step, an earthly nature, it is not surprising that its affinities and sympathies should be earthly; that earthly objects should possess a magnetic influence, perpetually attracting to themselves whatever is congenial with their own nature in the soul of the renewed man. Our homeward path lies through a world captivating and ensnaring. The world, chameleon-like, can assume any color, and, Proteus-like, any shape, suitable to its purpose and answerable to its end. There is not a mind, a conscience, or a taste, to which it cannot accommodate itself. For the gross, it has sensual pleasures; for the refined, it has polished enjoyments; for the thoughtful, it has intellectual delights; for the enterprising, it has bold, magnificent schemes. The child of God feels this engrossing power; he is conscious of this seductive influence. Worldly applause—who is entirely proof against its power? Human adulation—who can resist its incense? Creature power—who is free from its captivation? Love of worldly ease and respectability, influence, and position—a liking to glide smoothly along the sunny tide of the world’s good opinion—who is clad in a coat of mail so impervious as to resist these attacks? Have not the mightiest fallen before them? Such are some only of the many ensnaring influences which weave themselves around the path of the celestial traveler, often extorting from him the humiliating acknowledgment—“My soul cleaves unto the dust.” In this category we may include things which, though they are in themselves of a lawful nature, are yet of an earthly tendency, deteriorative of the life of God in the soul. What heavenly mind is not sadly sensible of this? Our ever-foremost, sleepless, subtle foe stands by and says, “This is lawful, and you may freely and unrestrictedly indulge in it.” But another and a solemn voice is heard issuing from the sacred oracle of truth—“All things are lawful unto me, but all things are not expedient.” And yet how often are we forced to learn the lesson, that things lawful may, in their wrong indulgence and influence, become unlawful, through the spiritual leanness which they engender in the soul! IMAGINE yourself, my Christian reader, shut in for a single day with one of the vilest and most degraded of our species. During that period, his whole conversation shall be an attempt to tamper with your allegiance to Christ, to undermine your principles, to pollute your mind, to infuse blasphemous thoughts, to wound your conscience, and destroy your peace. What mental suffering, what grief, what torture would your soul endure in the period of time! Yet all this, and infinitely more, did Jesus pass through. For forty days and nights was He enclosed in the wilderness with Satan. Never were the assaults of the prince of darkness more fearful, never were his fiery darts more surely aimed and powerfully winged, and never had so shining a mark presented itself as the object of his attack as now. Our Lord’s exposure to temptation, and His consequent capability of yielding to its solicitations, has its foundation in His perfect humanity. It surely requires not an argument to show that, as God, He could not be tempted, but that, as man, He could. His inferior nature was finite and created; it was not angelic, it was human. It was perfectly identical with our own, its entire exemption from all taint of sin only excepted. A human body and a human mind were His, with all their essential and peculiar properties. He was “bone of our bone, and flesh and our flesh;” He traveled up through the stages of infancy, boyhood, and manhood; He was encompassed with all the weaknesses, surrounded by all the circumstances, exposed to all the inconveniences, that belong to our nature. He breathed our air, trod our earth, ate our food. The higher attributes of our being were His also. Reason, conscience, memory, will, affections, were essential appendages of that human soul which the Son of God took into union with His Divinity. As such, then, our Lord was tempted. As such, too, He was capable of yielding. His finite nature, though pure and sinless, was yet necessarily limited in its resources, and weak in its own powers. Touching His inferior nature, He was but man. The Godhead was not humanized, nor was the humanity deified, by the blending together of the two natures. Each retained its essential characters, properties, and attributes, distinct, unchanged, and unchangeable. 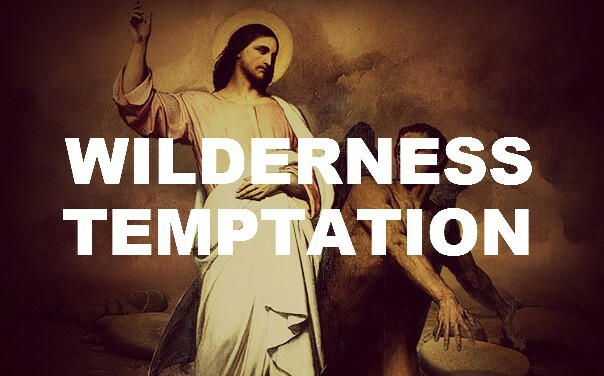 But let no one suppose that a liability in Jesus to yield to Satan’s temptation necessarily implies the existence of the same sinful and corrupt nature which we possess. Far from it. To deny His capability of succumbing to temptation were to neutralize the force, beauty, and instruction of the eventful part of His history altogether. It were to reduce a splendid fact to an empty fable, a blessed reality to a vague supposition; it were to rob Jesus of the great glory which covered Him when left alone, the victor on this battlefield. And yet that He must necessarily be sinful, in order to be thus capable of yielding, does not follow; it is an error of judgment to suppose that the force of a temptation always depends upon the inherent sinfulness of the person who is tempted. The case of the first Adam disproves this supposition, and in some of its essential features strikingly illustrates the case of the second Adam. In what consisted the strength of the assault before whose fearful onset Adam yielded? Surely not in any indwelling sin, for he was pure and upright. There was no appeal to the existence of an corrupt principles or propensities; no working upon any fallen desires and tendencies in his nature; for, until the moment that the blast swept him to the earth, no angel in heaven stood before the throne purer or more faultless than he. But God left him to the necessary weakness and poverty of his own nature, and thus withdrawing His Divine support and restraint, that instant he fell! That our adorable Lord did not fall, and was not overcome in His fearful conflict with the same foe, was owing solely to the upholding of the Deity, and the indwelling and restraining power of the Holy Spirit, which He possessed without measure.